I still have this lousy cold. I can't believe it has lasted so long. It is starting to feel normal to be coughing all the time! I still am getting emails from students who have signed up for the course over a year ago. Yes, you can continue with the course. No, you do not have to pay again. If you'd like the link to my DropBox, send me an email. I didn't get that many lessons to review this week but those that I did were all great. Keep up the good work. The cold days of February are ideal for knitting swatches. By the way, I will be out of town at the end of February at Stitches West so if you send in your lesson at that time, I won't be able to review it until I get back. I will have my iPad with me so I can answer any questions and if you order the course at that time, I can send you the materials. I was looking at some knitting a few weeks ago and was struck by the cast on edges. I think that many of us, when we learn a technique are so thrilled that we can do it, we don't stop to look at the results and see if it could be better. That is one of the things I love about the Masters Program. It helps you develop a critical eye for your own work. The tip this week is about the cast on edge, particularly the long tail cast on. What is the purpose of the cast on? It is supposed to provide a firm yet elastic foundation for the piece. There are many types of cast on techniques and each has strengths and weaknesses. The long tail cast on is a very versatile technique. Most find its appearance attractive, it works for most types of projects and it is fairly easy to master. What are the downsides? If it is worked loosely, it can look sloppy. It does not provide an adequate foundation for the piece. 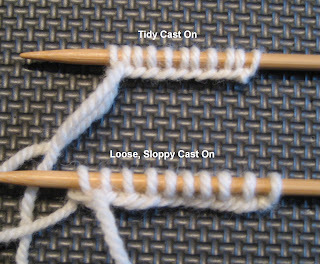 The loopy stitches can be easily snagged. 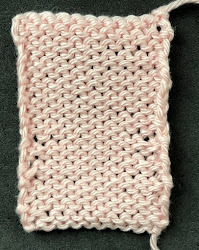 To work the cast on properly, make sure to tighten each stitch. The spacing between each stitch should be consistent. If it is difficult for you to tighten up, try using a smaller needle for the cast on edge. Use the needle size for the project for the first row. I think many knitters cast on loosely so that it is easier to work the first row. The first row may be more difficult to work but the results make it worth the time to do it right. If the bottom edge is ribbed, once you have worked a few rows, stretch it. The edge should have the same elasticity as the piece. If it is much looser, give it another try. The long tail cast on does not seem to provide an edge that is too tight. At least I have never been able to work one. 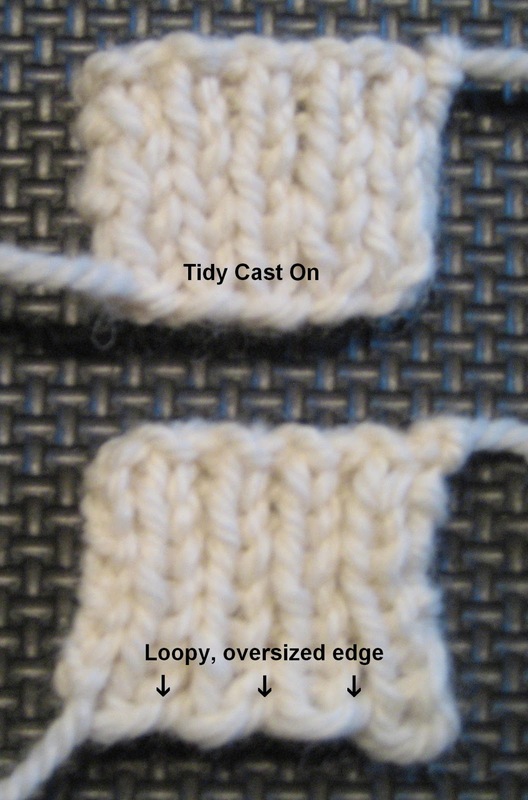 If you need an inelastic, edge, try a different cast on technique. The cable cast on is a good choice. I finally finished the tunic. Overall, I am pleased. I even finished the pattern. So far, I've kept my New Year's Resolution. Here is a close up of the neckline. 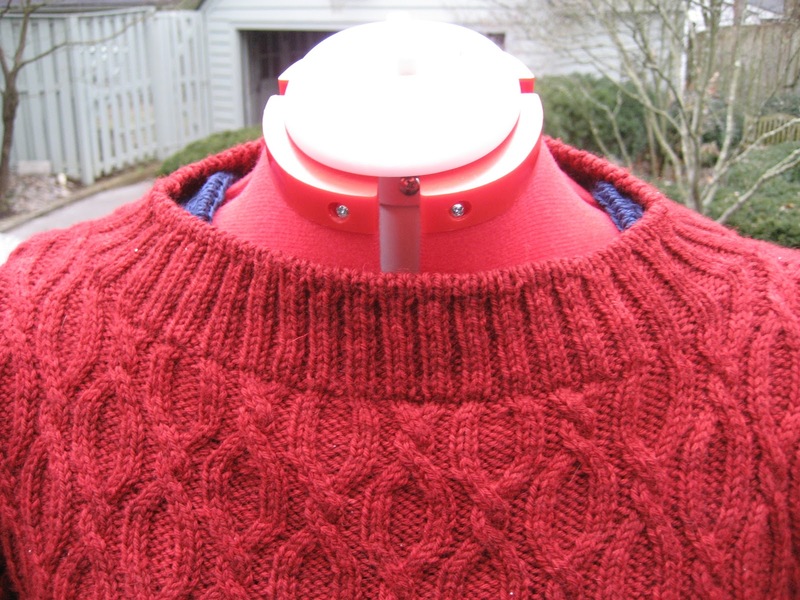 I ensured that the last row of the neckline was a K2P2 so that the neckband would line up. As you can see in the sample, I used a tubular bind off which I like for necklines. This is optional in the pattern. The last thing I have to do for the photo shoot on Wednesday is the over-the-knee socks. These socks accompany an article on the jogless join. I always make socks for my friends' kids when they go off to college in their school colors. I thought "dorm socks" would be fun. My daughters convinced me that these socks should be over the knee. They really didn't take that long. There are paired increases at the center back of the calf. I reversed out the colors. I used Solemate from Lorna's Laces with Outlast. It was very nice to work with. Don't you love my legs? When I finish up these socks, I have some birthday presents (late as always!) 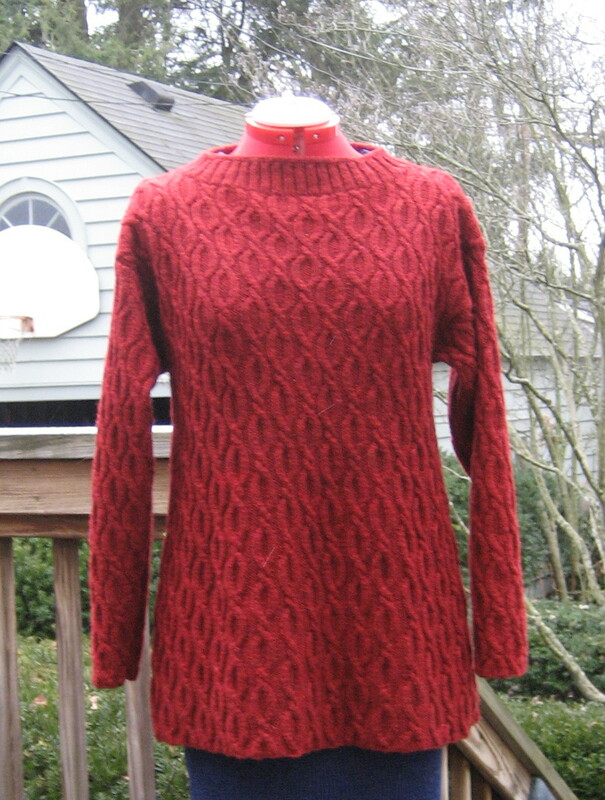 to work up and I need to seriously think about the sweater I am doing for the Fall issue. It is the third in the series of the Utah by Norway sweaters. I am meeting with the folks from Redfish Dyeworks at Stitches to select the yarn. The sweater will be a stranded design in spring colors. I sent Elff a video of the peony gardens at Ashland (Henry Clay's home) so she can match up some pinks. The design will be floral...the background color will be dark dark purple...the color of black irises. The inspiration is Memorial Day in Utah. The design is for my mother who died last year and was an avid gardener. Yes, I do love those legs, also the 1-1/2 over-the-knee socks that surround them! Hope you get over that cough soon - it certainly hasn't seemed to hold your knitting back though.